Zach Haas gets a pin against a South Tahoe wrestler during Truckee's home opener on Dec. 4. Haas went 3-0 last weekend at a tournament in McQueen to capture first place out of the 182-pound division. 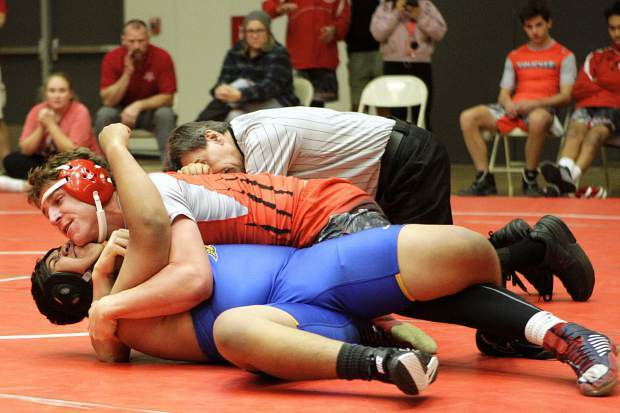 The Truckee wrestling team traveled to McQueen High School in Reno last weekend, and had senior Zach Haas captured first place in 182-pound division. Haas took wins in each of his three matches to pick up the individual win and is unbeaten in his last two meets. The Wolverines also had junior Kevin Castellanos take third place in the 220-pound division, going 3-1 during the tournament. Freshman Campbell Walter, sophomore Keihan Infantes, sophomore Max Gordon, and senior Evan Fiddyment all picked up a win at the tournament. Truckee also had Brandon Velasquez, Joaquin Mendoza, and Jairo Caden wrestling for the team. The Wolverines head to Folsom this weekend to wrestle in the Folsom Jailbreak Duals.